This is how a man who is used to cooking using a different system of measurements makes a fantastic luncheon for four: consistency. Our house guest from Spain made a delicious paella using a double espresso cup as a measure and a practiced eye. 6 cloves of garlic, minced or pressed. Pour enough oil into the pan to cover the bottom to a depth of 1/8″. Heat pan over high flame. 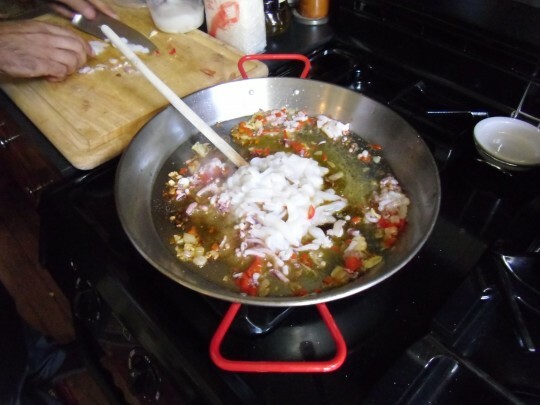 Add the onion, red bell pepper, squid and garlic. Sauté, stirring, until the onions are translucent and try not to brown the garlic. 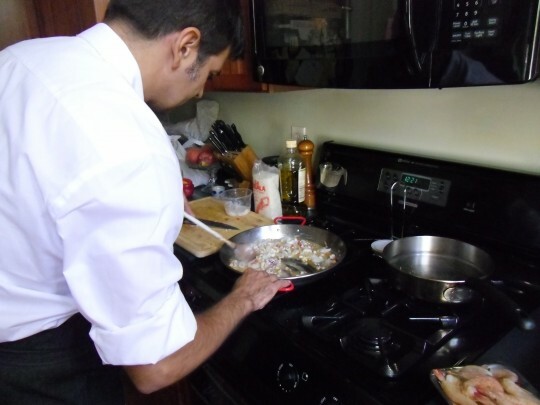 Add the rice and stir to absorb any excess olive oil and to mix in the other ingredients. If there isn’t any oil, add some more to coat the rice. Cook for three minutes more. Add in the broth, stir to combine and leave it alone. While the broth is reducing, do not stir the pan. Instead, turn it on the burner to make sure it is cooking evenly. When the broth is mostly reduced, add the shrimp in an attractive circle, reduce the heat and cover with a moist towel to steam the shrimp. It will be ready in three or four minutes. To check, make sure the shrimp have turned pink. Keep it covered and make a side salad or two. More on that tomorrow. A last note: do NOT serve this with that lemon flavoured iced tea. It is a terrible match. Far too sweet. Opt for sparkling water, a dry Spanish rosé, an Albarino, or a white Rioja. 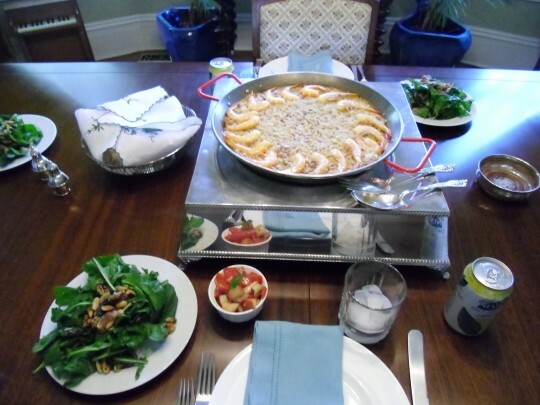 This entry was posted in Entertaining and tagged Albariño, Luncheon recipes, Paella, Rioja, Seafood paella, Spanish Rosé, Squid, Wine and food pairings. Bookmark the permalink. Hmmm (and Yumm) Inigo sounds Basque. And the Basque Country (except for ETA) is a little bit of Heaven on Earth. 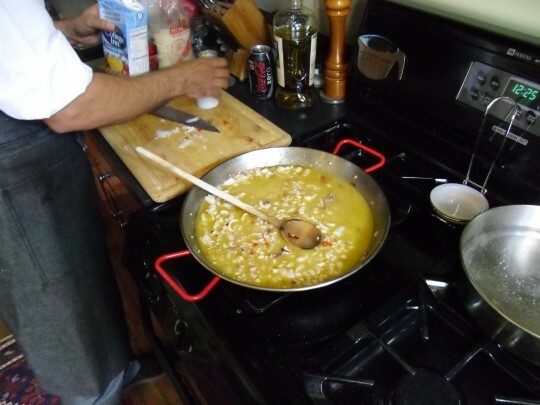 You can add spicy sausage (Spanish Chorizo), chicken and clams to the Paella and that would make it Paella Valenciana. I love your recipe posts; please keep them coming. Very astute Mary. He is from Bilbao, although he lives between Barcelona and Madrid now. Real Paella. What a treat. Hello Mig and welcome! 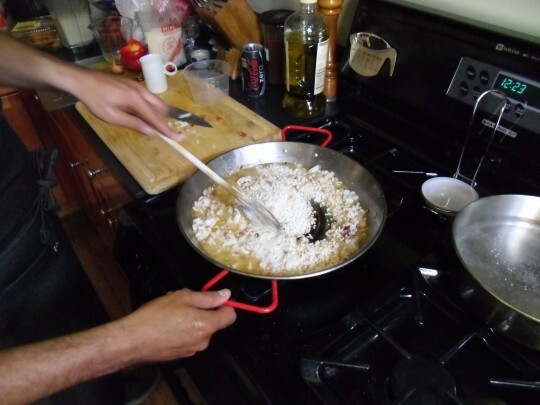 The rice is Spanish, La Cigala, which is whole grain and absorbs broth very quickly. It was added uncooked and may have been 20 – 30 minutes on the heat after sautéeing it in the oil. Architect, remind me, I’ll make it next time you’re over. This was dinner tonight. Fantastic! Stephen P, Horrah! Glad you enjoyed it.